It would be interesting to have him in G25. They were definetly not. Estonians just have more Hunter-Gather ancestry than other Europeans but most of there ancestry is still steppe+ EEF. I2a1b among Slavs was probably not directly mediated by WHG/SHGs and is most likely a GAC-like which somehow managed to expand despite the IE migrations into Central Europe. Last edited by Coldmountains; 02-12-2019 at 12:43 PM. They were definetly not. 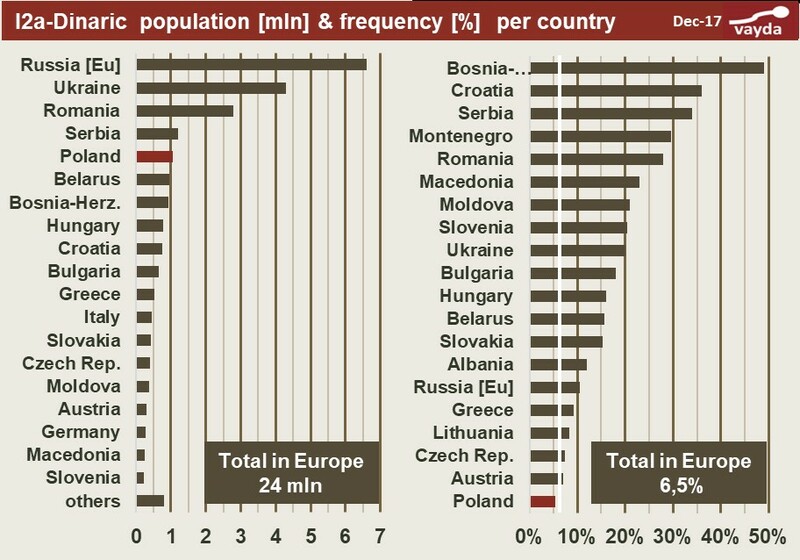 Estonians just have more Hunter-Gather ancestry than other Europeans but most of there ancestry is still steppe+ EEF. I2a1b among Slavs was not directly mediated by WHG/SHGs and is most likely a GAC-like which somehow managed to expand despite the IE migrations into Central Europe. From today's dispersion of I2a1b (actually I2a1a2) root clades, it follows that Isles clade called Disles and Slavic called Dinaric most probably spread from the territory which is today called Germany. So, yes, I2a1a2 was probably part of GAC populations living in the Central-North Europe in time when the Steppe pops expanded to West Europe. They were definetly not. Estoanians just have more Hunter-Gather ancestry than other Europeans but most of there ancestry is still steppe+ EEF. I2a1b among Slavs was not directly mediated by WHG/SHGs and is most likely a GAC-like which somehow managed to expand despite the IE migrations into Central Europe. Of course it's because of the HG factor as such more 'Baltic-like', but Loschbour is more Western/Atlantic Europe. Atlantic in K15 is missing in Steigen! Last edited by Finn; 02-12-2019 at 12:54 PM. It makes zero sense to break down ancients with models that are designed for moderns. All HG give high affinity with the Balticum because of the anachronistisch comparison! Still we are able to see the very very global difference, Loschbour in the Luxembourg area, is more Western.....Steigen more Northeast. I dont think modern calculators can capture the genetic reality of such ancient samples very well. While they may appear relatively close to modern populations on lets say K36, they are actually incredibly distant on something like g25 or even a calculator that is designed for ancient samples. Yes they are incredible fare on distance and there is a lot of drift etc. Still Loschbour is an example of WHG, that was an input in the West European population. Steigen is an example of SHG and is an input in the NNW European population. That’s basic and I guess not weird to think. Do admixtures, indeed made for modern populations confirm this? Yes in a certain way because taken with tons of salt you can still see Loschbour has a more West European/Atlantic affinity, Steigen has a much more Northern orientation. What’s not correct in this respect??? Last edited by Finn; 02-12-2019 at 04:17 PM. I doubt that I2a1a2 was present in Sredny Stog and Yamnaya. There are documented only I2a2 clades. Direct mediation via Hunter Gatherers is also possible knowing that Balto-Slavic stems from Baltic_BA which has partial origin from Baltic HG. But Disles clade with TMRCA about 2300 BC came to Isles probably from the territory of Germany (together with Beakers), so I opt for GAC (Globular Amphora Culture). Last edited by ph2ter; 02-12-2019 at 07:36 PM.